It seems that all things relating to Microsoft’s Skype service has been top of the gossip over the last couple of days, with the company releasing an additional mobile version of the app for Windows Phone, as well as bringing the Skype experience for the first time to a portable gaming device with their free of charge PlayStation Vita app. iOS developer dmarinov has turned the tables, bringing the attention back to jailbroken iOS devices with the release of his aptly named Call Recorder for Skype tweak that has hit Cydia during the course of the last day. The primary purpose of the package is fairly simple and self explanatory; allowing users to record voice Skype calls directly on to their device as a plain audio file. Having the ability to record those Skype calls is likely to be a feature that will prove very useful to a lot of people, especially those who use Skype on a daily basis for business-based conversations. After all, it is always good to have that extra bit of backup if anything that was discussed during the call gets disputed at a later date. After installation, the Call Recorder for Skype tweak does not install any additional home screen icons, but instead, does most of its work from directly within the official Skype app that is available from the App Store, but also comes with a preferences bundle within the native Settings app. The functionality is as simple and efficient as giving or denying the tweak permission to record calls and is operated through the toggle of a simple Boolean value. 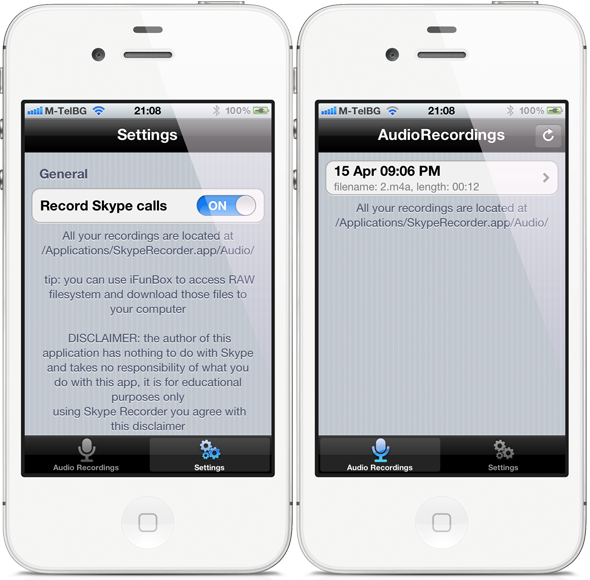 When accessing the Settings bundle, users can opt to either turn Skype recording on or off. Obviously, if the toggle is flipped to on then each time a call is placed or received through the Skype application, it will be recorded and saved directly to the device with the information being displayed in the Audio Recordings tab in Settings. The developer has also left a little tip in the description within Cydia. If the Skype account in question has available credit, then the tweak will enable the ability to record standard phone calls. It is worth noting that you should never record a conversation without informing the recipient of the call that they are being recorded. Call Recorder for Skype is available to download from the ModMyi repository at a cost of $6.99 and requires iOS 4.0 or above. The tweak works on a one-off payment basis and requires no on-going subscription charges.